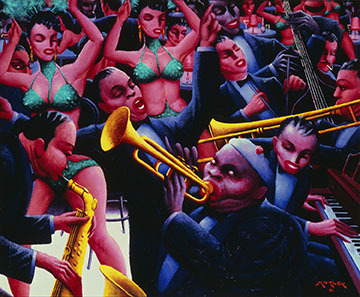 Archibald J. Motley, Jr., Hot Rhythm (detail), 1961. Oil on canvas. Gift of Mara Motley, M.D., and Valerie Gerrard Browne in honor of Professor Richard J. Powell and C.T. Woods-Powell and in memory of Archie Motley. © Nasher Museum. Photo by Peter Paul Geoffrion. Realism and Surrealism in the United States, 1930 – 1960 offers a glimpse into the art and cultural attitudes of the United States during the years surrounding World War II. It is on view through May 10, 2020. This installation offers a glimpse into the art and cultural attitudes of the United States during the years surrounding World War II. In the first decades of the 20th century, the avant-garde styles of Cubism and abstraction adopted by some artists reflected an optimistic take on mechanization and modernity. By the 1930s, however, as the Great Depression took hold, many artists turned toward representational and narrative art that confronted subjects such as unemployment, the inequitable distribution of wealth and an imbalance of political power. These styles, often referred to as social realism or social surrealism, were used to create scathing commentaries that directly addressed contemporary issues. The decade following the war was one of optimism and general prosperity in this country. As a result, surrealism waned and the realism that emerged was typically less overtly critical but maintained a strong interest in humanist concerns. The largest work in the gallery is David Burliuk’s Shame to All but to the Dead, a mural-sized allegorical painting created in 1933 at the height of the depression. The artist, a Russian immigrant, depicts the stark contrast between those struggling to find work on the right and the sleek modern city on the left. Surrealist-inspired works by Walter Quirt, Helen Lundeberg and John Atherton, all created before or during World War II, are commentaries on violence and destruction. Painted immediately after the war, Michael Lenson’s Power Corrupts (A Political Allegory), is a chaotic scene and a brazen critique of politics and capitalism. 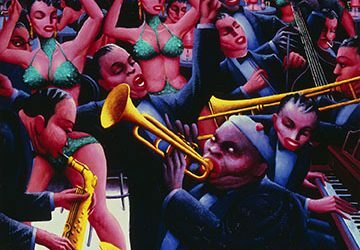 A much quieter tone is found in Eldzier Cortor’s surreal interior, Lady Knitting, and Charles White’s Girl with a Red Cape, both contemplative meditations on identity, while Archibald Motley’s Hot Rhythm depicts the lively atmosphere inside a Chicago jazz club. Special thanks to Marjorie (P’16, P’19, P’19) and Michael Levine (T’84, P’16, P’19, P’19) for their generous loans. 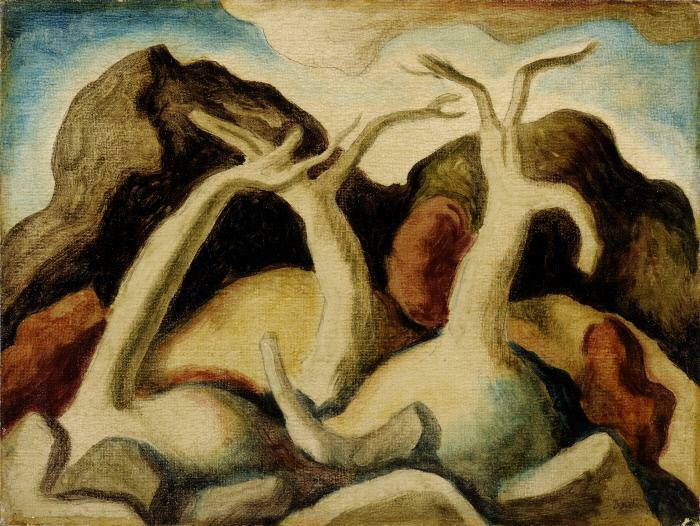 David Davidovich Burliuk, Shame to All but to the Dead, 1933. Oil on canvas, 66 x 144 in. (167.6 x 365.8 cm). Museum purchase. Archibald J. Motley, Jr., Hot Rhythm, 1961. Oil on canvas, 39 7/8 × 48 1/4 × 7/8 inches (101.3 × 122.6 × 2.2 cm). Collection of the Nasher Museum. Gift of Mara Motley, M.D., and Valerie Gerrard Browne in honor of Professor Richard J. Powell and C.T. Woods-Powell and in memory of Archie Motley; 2016.24.1. Image courtesy of the Chicago History Museum, Chicago, Illinois. © Nasher Museum of Art at Duke University. Thomas Hart Benton, Landscape, c. 1922. Oil on canvas board, 9 x 12 in. (22.9 x 30.5 cm)Frame: 16 1/4 x 19 1/8 x 2 in. (41.3 x 48.6 x 5.1 cm). Bequest of Louise and Alvin Myerberg.